The pine bookcase has a whole new look! When Ian, the Master Painter and crew brought it back yesterday, I was amazed at the transformation. Here is the original pine finish. Ethan Allen's idea of an antique pine piece, which over the years seemed to get more and more orange! My solution: paint it black and give it another chance in the living room with its newly clad grasscloth walls. I thought about painting it all black, or all white, but settled on the back tongue and groove boards being a crackled linen and the body distressed black. After the painters left, I immediately started putting all the books and nicknacks back. I can't believe how much stuff was on the shelves before. I ended up packing most of the dog collection away and just kept out my favorites. I mean, after all, they were taking over the shelves before! This morning, I couldn't wait to see the new bookcase in the morning light. I love how the black looks with the new paisley chairs and wallpaper. "When in doubt, paint it black," I always say! The living room is finally coming together. Next week, the new draperies will be installed, which is the last element, and the one that should pull it all together. Stay tuned for a complete, full-on, "ready for the holidays" living room reveal! Perfection! You amaze me every time! The black looks really great, especially the 2 tone look which makes your collections stand out. Really loving those chairs. I love the black and the two tone look.. and why is it that some pine gets so orange over the years? Is it what we are using to polish? I have some EA pine too... but not quite as orange as your piece got. I love the black. And it is perfect! T'was meant to be. 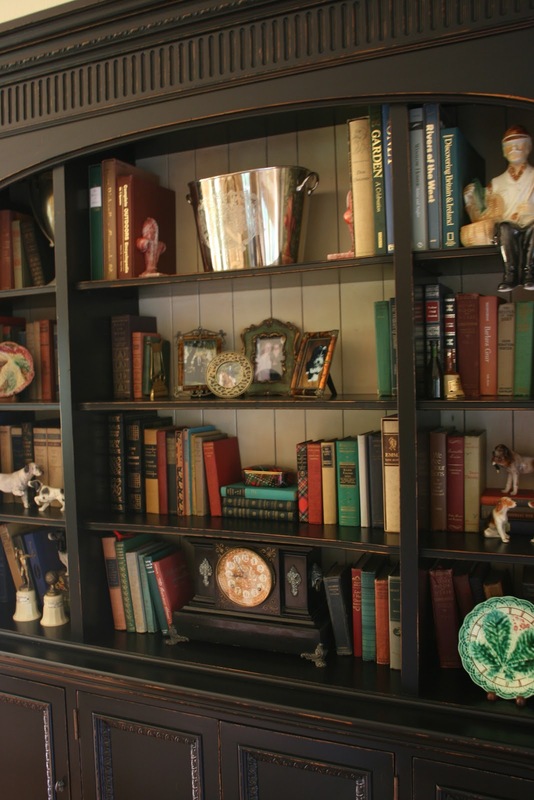 Love the transformation of the bookcase! Love those doggies too! The bookcase looks great painted black. Love the lighter linen background too. 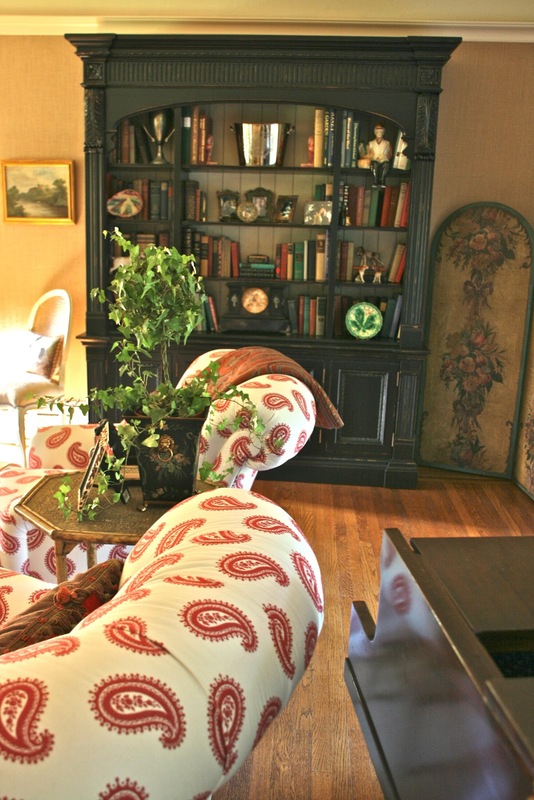 Those paisley chairs are great! This is absolutely beautiful. Love the color and the feel of the room. It is definitely coming together! Amazing piece of furniture! I LOVE it!! Your painter did a fantastic job and I can really tell how pleased you are with the outcome. I can't wait for the whole room reveal!! Have a great day and thanks for sharing this beautiful piece with us. it's absolutely gorgeous!!! I always love black furniture. totally changes the look! 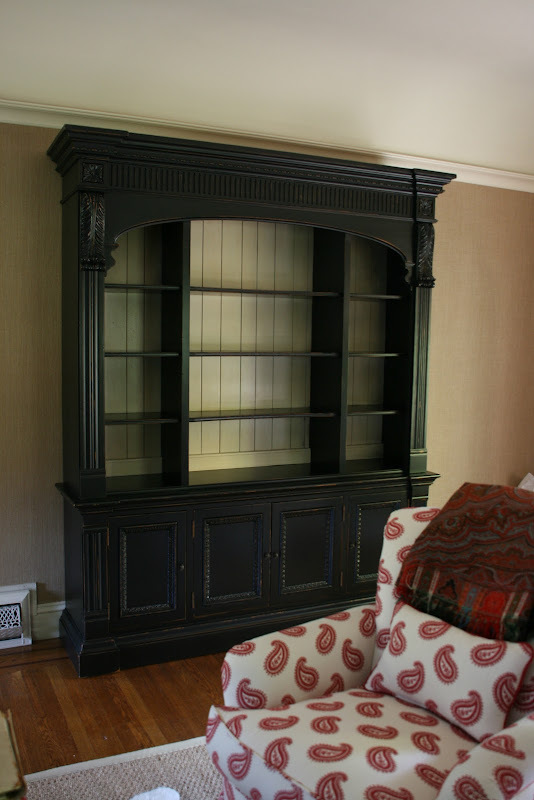 Delores the bookcase looks fabulous painted black! I love the linen back,it makes everything pop! Wow what a makeover! I love it in black...so dramatic and add so much presence to the room and then filled in with all the wonderful accessories..its perfect! It truly looks amazing! I'm about to do that to a piece I bought at an estate sale and it's been in the attic for over 5 years! I need to just do it! This has inspired me! Thanks for sharing! Hi D!! Omgosh, ♥♥♥it!! I agree with your theory about paint it black!! It looks like a totally different piece and it is so great against the grasscloth. Your living room is truly coming together beautifully. Definitely looks better painted black! I have loved that piece forever, and I am blown away by this gorgeous transformation! I'm a huge fan of black, and this is just over the top with the back boards. And next to grasscloth? Heaven. That is a beautiful piece! I liked it in the pine...but I love it painted black! What a beautiful room. Can't wait to see it all complete! I have to find me one of those...a master painter that is. Looks great! And totally agree, every room needs a good punch of black! This is absolutely perfect!!! I'm drooling with envy. I can't believe what a huge difference it made. Well, yes I can. That's a large statement piece and demands respect. Ha ha. Looks, Fab, Delores. You always make the right call. I'm waiting anxiously for the BIG reveal. Did you steal some of my china dogs? It is so beautiful. I love it. What a change, Delores. I love it. Absolutely the right decision - orange pine is my least favourite look but that black is just so classy; I just love the crackle looked contrast colour - it is simply stunning. I am usually a fan of "real wood", but I think that it looks great (even better) painted. I also think that it will also be more usuable when you change out styles in the future! I love how the black looks!! What an incredible difference Delores. I think the clock looks great against that distressed black and I always get a little excited over a crackle finish. Look forward to seeing your holiday-ready look. Fantastic work! Keep that painter! You really hit it out of the ballpark on this one. Imagine what it would cost to replace with your new black paint on it. Thanks for sharing. Such a nice backdrop for your collections.